Collette offers more ways to customise your tour with features such as pre- and post-night stays, on-tour options, optional excursions, and different travel styles so that you can make every day a personal adventure! 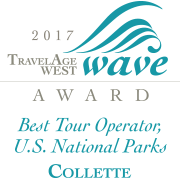 Collette can add pre-or post-night stays to your existing itinerary along with tickets to your host city’s best attractions. Arrive a little early, stay a little longer and return home with even more memories of the world’s best cities.